1) During the Day Phase players discuss and vote for who they wish to incapacitate. In the event of a tie, nobody will be incapacitated. 2) Votes should be bolded, coloured, or made to otherwise stand out - if your vote is miscounted because you were not clear about it, tough. 3) The Day Phase will last 48 hours, or until every player has cast their vote. You may cast your vote as "nobody", if you are happy with the current votes and wish to get the day ended early. A tied vote results in no incapacitation that phase. 4) During the Night Phase players with roles should PM me any actions they wish to take. The Night Phase will last 24 hours, or until every player has PMed me their action. 5) There are two main groups: Pokemon and Team Rocket. Pokemon are the regular innocents, who are Team Rocket's main goal. If they catch all the Pokemon, they will win. 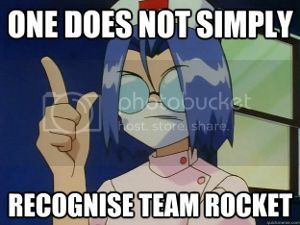 Team Rocket, are of course - the enemy. There are other roles too, not everyone has the same conditions for victory, and there are certain exceptions to these rules. 6) The goal for the Pokemon and the innocents, overall, is to incapacitate all members of Team Rocket. They have only 4 chances to do this, before Team Rocket's master plan comes to fruition and they win automatically. So preserve your votes and be careful. Now that that is out of the way, I am taking sign-ups for the game. I will keep it to 10-15+ as I believe the game will work well with a larger crowd. So sign up so long as you can commit to be active and participate!! Also I hereby call dibs on hosting the next game! I'm afraid Bleck has already called prior dibs mate. So its me now, Bleck next, you after that. Soon my plans shall come to fruition! Bwahahaha! Convert me to a number and count me in. HOLD IT RIGHT THERE TEAM ROCKET! It's great that within a few hours we already have ten members for this. But i'm likely going to let it sit and stew for another day/half a day, in the hopes of getting the last few members. Preferably i'd like 15+ but if its clear we won't be getting any more, before that, i'll start the game. aye lets try this out. I'll look in the previous round to see how this goes exactly as I am not familiar with the forum versions of these kinds of games. I want in! Is there still space? Yes, we've still got space. We have 13 in our game now. But i'll wait a few more hours before beginning this to give people one last chance to join. It's a beautiful day in the world of pokemon! The sun is shining, the grass is green and... what's this? Our intrepid heroes seem confused, where are all the pokemon? No pokemon in the sky, or in the sea, and there's hardly a pokemon to be found on land! ... so? how does the first day usually go by? do we get information on what the various roles do what or is that part of the mystery? Generally, you can choose to reveal your role or not and we can choose to believe you or not. For the most part, people do not reveal their roles as it singles them out to the bad guys. So for instance, unless the innocents have something serious to gain by telling people you are the detective role, you shouldn't reveal it because the bad guys will want to get rid of you, as it reduces the chances of them being discovered. The first day phase is boring and uneventful, usually. Nobody's died yet so there's absolutely no clues. We mostly just take opening statements and draw things from them (we're usually wrong, but the odds are stacked against us after all). People are usually rather secretive about their roles, since saying 'hey I have super power X' makes you a prime target for zombies/witches/wolves/mafia/team rocket. Since we only have 4 burns (still only 4? not 5 because of the amount of people? ), we should take care in using them. So far the first day seemed to have resulted in a burn of nobody and this time will be no different I think, but I want to know what other people think, maybe stir up some conversation in this joint.